You must make reservations at least 5 minutes in advance of the time at Little Rhein Steak House. 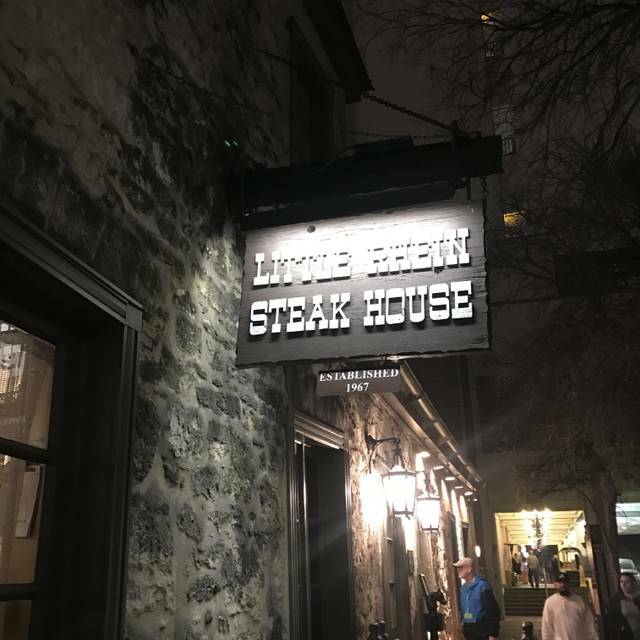 Located next to the Hilton Palacio del Rio on S. Alamo St.
Little Rhein Steak House is renowned worldwide for perfectly prepared steaks, an award-winning wine list, and its casual, rustic charm. 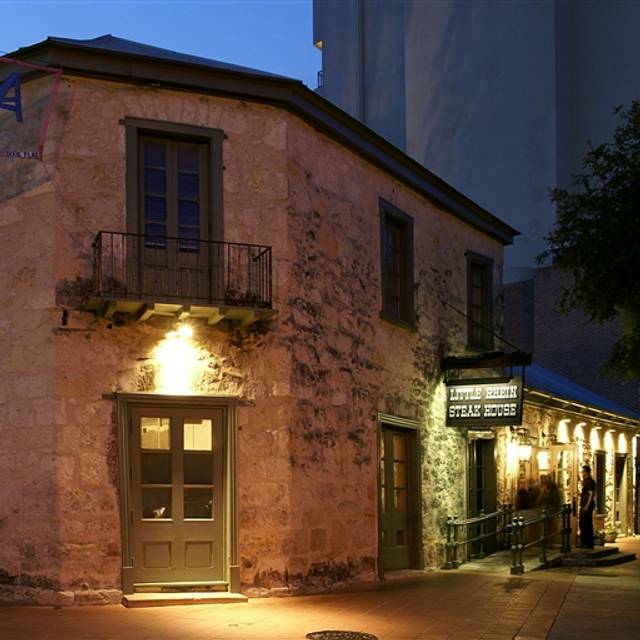 Opened on San Antonio's Riverwalk in 1967 in the historic Otto Bombach House, Little Rhein has long been a favorite restaurant for movie stars, professional athletes, political leaders, and other celebrities. Of course, local residents and visitors enjoy it as well, and Little Rhein is a top location for destination event planners. 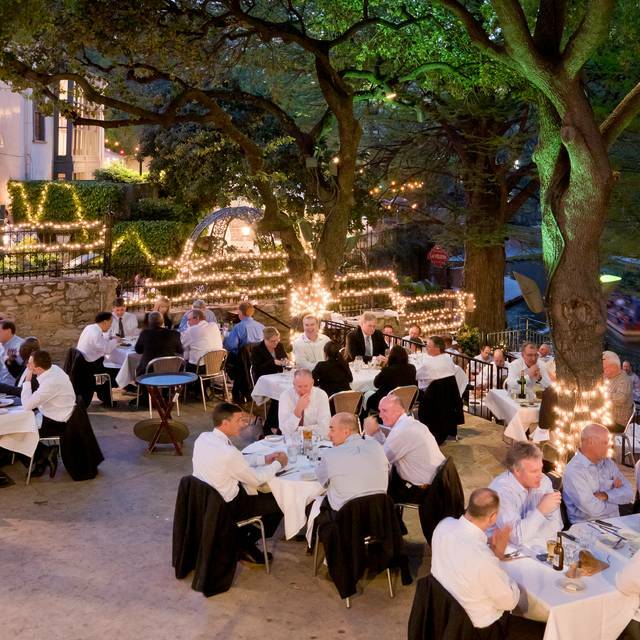 Little Rhein and its sister restaurant, The Fig Tree, located right next door, set the standard for fine dining on the Riverwalk. Stop on by and enjoy a delicious meal in a historic setting. 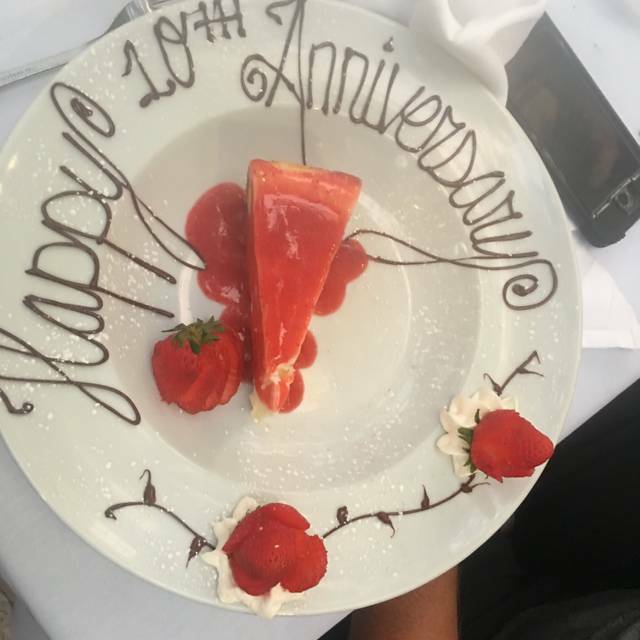 Excellent service, food was amazing, we loved everything! Phillip was great! Will definitely recommend and return when we visit San Antonio again. Not to be missed. The meal was wonderful. The service was excellent, which is a pleasant surprise for a restaurant off of the Riverwalk. This is the type of service that is missing in San Antonio. I was a wonderful meal and the seating was just right so we could watch the river while we enjoyed the meal. We were sat earlier than our reservation, instead of being made to wait when tables are ready. Overall this is definitely one of the restaurants I would suggest to go to off the Riverwalk and downtown as a whole. The Ambiance and location of Little Rhein are it's main saving graces. The food is between fast food and Golden Corral. For the prices I was expecting fine dining. Instead we were served buffet food quality at luxury dining prices. The service was friendly and prompt and the view was very pleasant. Food was amazing and there service was awesome as well. Booked with open table and showed up about 10 minutes early and was seated immediately. Food was brought out in a quick manner. Definitely a go to for steakhouses in San Antonio. The food was great. The service can be better. My server didn’t explain how they cook the steaks. Presumably, they undercook by a degree all medium rare steaks. I heard this from another server as she served another table. She suggested the person ordering to adjust the temperature since they undercook their steaks. Well, my server didn’t say anything and sure enough my steak was a bit undercook. They adjusted but have the server say something from the beginning like the other server did, I would have asked them to prepare the way I like it from the beginning. Our last night in San Antonio brought us just a quick jaunt from our hotel to the Little Rhein. What an experience! We approached from the river walk and were treated to a triple tier seating venue with lit trees, white tablecloths and warm air! We entered through the main door street level and took a few moments to check out all the memorabilia in the main room. So much to look at! Very cool! We were seated on the lower tier at 7:45 (party of four) earlier than our open table reservation of 8:00 pm. Staff was accommodating and very friendly. Our server ysemin? Explained each part of the menu, what items came with what, how to order the temp of the steak and was great with the kids (15 & 13). To start I had the wedge salad -perfection! Cold and crisp with the tangy blue cheese and salty bacon. The girls shared a Caesar salad (glad we didn’t order two there was plenty) and my husband got the field greens, very nicely dressed. For our entree, three petite filets, all perfectly cooked to temp with baked potatoes, asparagus and Mac and cheese which was divine! Of course chicken tenders for our picker eater who proclaimed these were the “best ever!” The evening grew dark and the trees lit up beautifully! The river walk was not super busy and allowed us wonderful time together as a family! We came to SA to celebrate our engagement at Lackland 22 years ago, our daughters 15 birthday and our 20th wedding anniversary! This was a perfect way to end the trip with two desserts on the house for us! The mudball was a perfect little sweet treat and the cheesecake was classic and delicious! Thanks to Little Rhein for our wonderful last evening! I love Little Rhein Steak House! I visited as a child with my family, then again with my husband in 1992 and again this visit for our anniversary! It never disappoints! LOVE the food, sitting and watching everyone walk by. Highly recommend! Food was amazing. Must get jalapeño twice baked potatoes! The Little Rhein Steakhouse has never failed to delight me. Situated on the edge of La Violeta, it is the only restaurant along the Paseo del Rio with terraced outdoor seating. The indoor seating is inside a historic hill country house. The food is superb, and, while pricy, well worth it. Add the centuries old trees shading the outdoor tables with fairy lights, and you have a ready-made romantic evening. It was a lovely evening to be outside enjoying the Riverwalk. Our waiter did not hurry our meal and was always available when something was needed. Little Rhein is a favorite when we are in San Antonio. My out of town guests loved it ! Great ambiance. Food prepared to perfection. One of the best steak establishments that we have experienced. Old world style and charm. 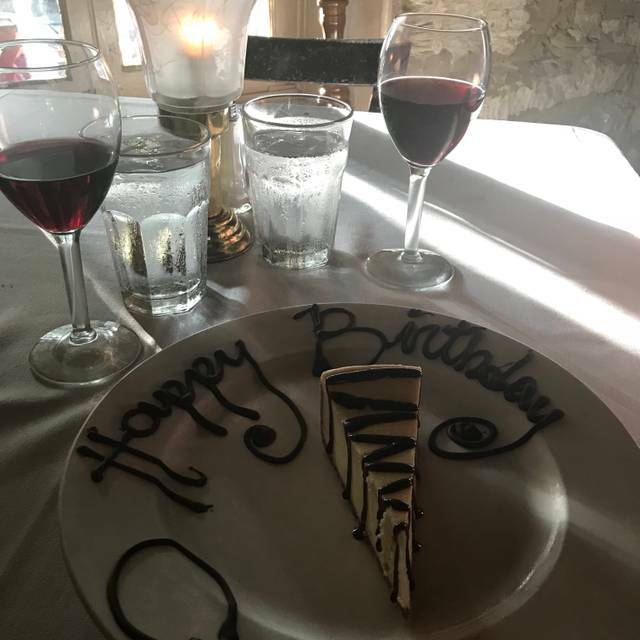 My husband and I celebrated my birthday at the restaurant. The whole evening was fantastic. Food, drinks, service, ambiance, and view were outstanding. Thank you for making the evening so special. This is definitely a special-occasion restaurant if you're from San Antonio as it is expensive for what you get. I'm sure it gets a lot more tourists than locals due to its location on the beautiful riverwalk. While it is expensive, the food is good and the service is as well. Food was super average if that. The steaks weren't not very good. Potatoes and dessert were the best part of the meal. Even the bread was just OK. Setting is lovely right on the river. And Rudy our waiter was great. As far as food goes just not great. Probably wouldn't return. Such a awesome place. The view, the food, the service... everything was fantastic. This is our second meal at Little Rhein Steak House. The food is delicious, the service excellent and the location beautiful and easily accessible. Fantastic Service! Joe was our waiter and took very good care of our table. I was on the patio and there was a very loud group on the patio that was so loud, I had an issue hearing my guests at our table. Other than this item, the experience was good. Oh and a big shout out for our waitress “Yesinia” great job and thank you! My steal was not cooked to order. I wanted medium well it was easily medium rare. Otherwise food was good service exceptional. Nice little restaurant. This was a great restaurant with terrific service and views of the Riverwalk. The food was fantastic. We thoroughly enjoyed our visit. We had a lovely dinner outside. Delicious steak and great service. They even provided a poncho when the wind really chilled things down. Wonderful fine dining experience on quieter part of Riverwalk. Enjoyed sitting on enclosed porch on windy night. Service was excellent with a very personable waiter. We enjoyed escargot to begin, followed by fillet mignon and lobster tail entrees. Were treated to toffee pudding dessert in honor of birthday. Especially enjoyed the relaxing atmosphere away from Riverwalk crowds. Highly recommend. Nice location beside the river. Great service and very good food. Rosa is a wonderful server. Extremely friendly, and very down to earth. For such a hi end establishment, it's great that you can go in your casual attire or go dressed up and you will still feel welcomed. 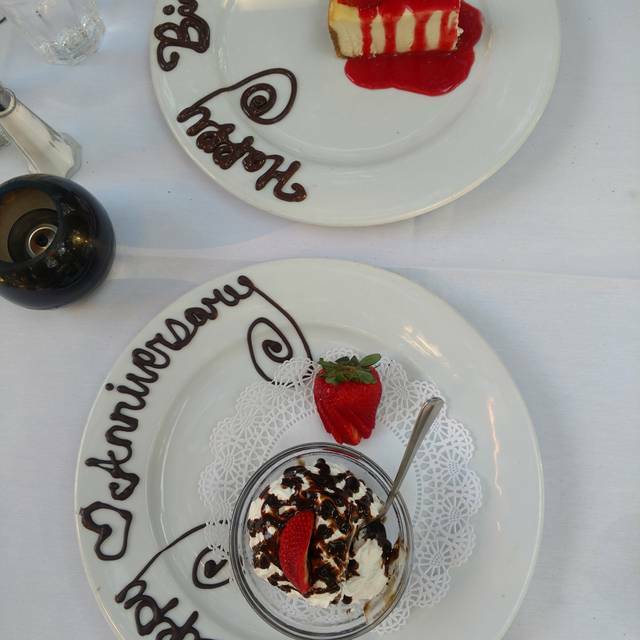 We enjoy our anniversaries there and they never disappoint. Went to your restaurant in July. (26/27) 1976 on my honeymoon, and have returned several more times with my 1976 wife, children, and friends. Everything as good as it was in 1976, and will return again when in San Antonio. Would like to Prime Rib offered more often on the menu, and a ramp of some sort for your customers coming in from the riverwalk and in front of the restaurant. Thank you for another pleasant dining experience. Sincerely , David Green, David Green, Houston, Texas. Our server was very attentive. The steaks were cooked properly but they were cold. One in our party did not get her food until the rest of us were almost finished. I have eaten here many times with good results. They were not on top of it tonight. Service was terrific. Food was great but expensive. Wonderful! 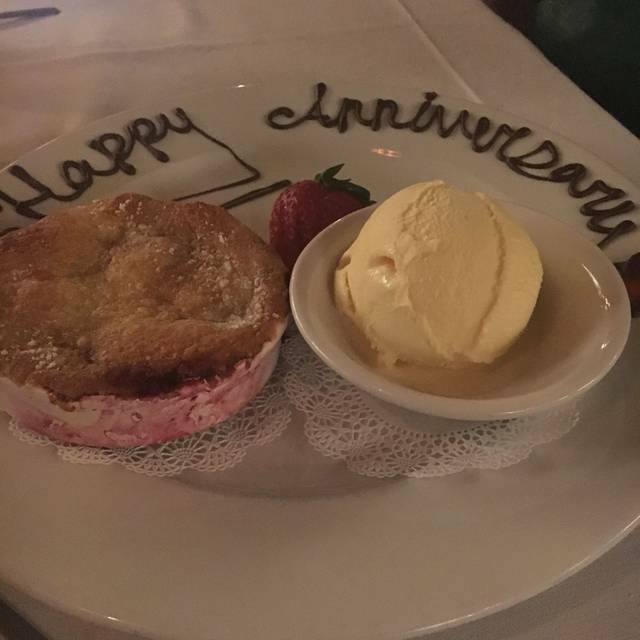 Romantic and peaceful with fabulous food and service! The food and view were great! Good to do it once. Great food, fantastic view from the patio, but the price is just criminal. We wanted our steaks medium plus. Waiter insisted that we order them medium well. They were past Well. Cremated! They offered to cook some more but it was too late . Our much anticipated dinner was ruined ! We came to San Antonio from Alabama to celebrate our one-year anniversary and chose your restaurant based on reviews. We could not have been more pleased by our experience, as we sat overlooking the Riverwalk drinking a bottle of wine and eating steak. The service — just wish I remembered our waiter’s name — was impeccable. The food was amazing and the atmosphere, warm and inviting. It is a place suitable for special occasions, business dinners, and dinners for families. We couldn’t be more pleased with our experience. Thank you for helping us celebrate such a momentous time in our lives. Steak and sides were good but didn't wow me, could have used more seasoning. 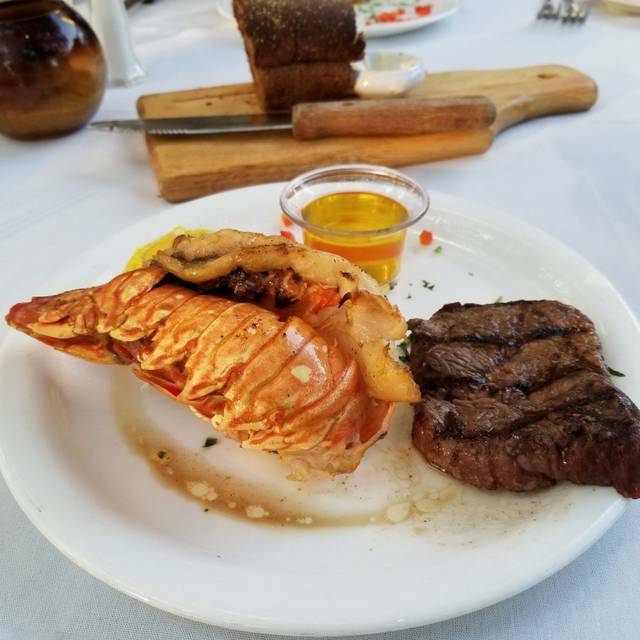 The lobster tail was cooked perfectly. The sticky toffee pudding was the best thing we ate and it was incredible. 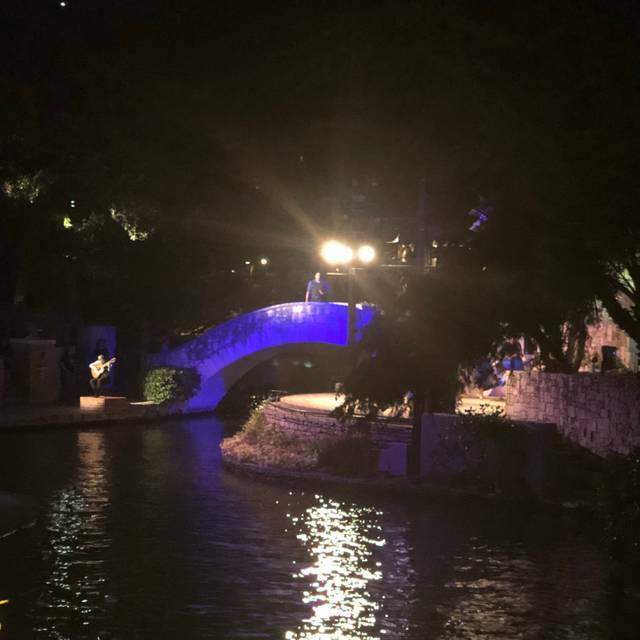 The location was great and we loved sitting outside where we could see the riverwalk and hear the music at the amphitheater. Everything was exceptional, except the waiters/servers accidentally gave one of our party the steak of another of our party. One of the members ordered a steak medium rare, and another ordered the same type steak medium. That was the only negative, and it slightly embarrassed me, because I raved how great LRS is, and the San Antonio native member receiving the medium rare steak was the only one in our group who had never been to LRS. Everything turned out well, because the member said it didn't disappoint him that much, and LRS didn't charge us for our desserts. Overall, it was a great visit.